St. Patty’s Day Oatmeal Cookies. 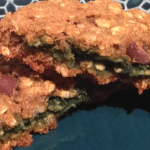 Gluten-Free and Vegan and GREEN! 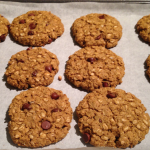 I’ve been experimenting with different nut and seed butters in my baking adventures and I stumbled upon this cool mixture that produced yummy, chewy, oatmeal cookies with a green centre. I figured it was due to the sunflower seed butter content. Perfect for St. Patrick’s day right? I shared them at work with staff and patients today and I think they were a hit. I’ve made them gluten-free, however, I’m sure the recipe would work fine with regular wheat flour. 1/2 cup mini dark chocolate chips. My favourite is Camino. –Preheat oven to 350F and line a baking sheet with parchment paper. 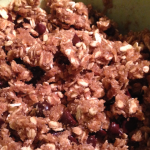 -In a large bowl, combine the oatmeal, flour, brown sugar, baking soda, cinnamon and salt. -In a medium bowl, whisk together the milk, pumpkin seed butter and vanilla. Pour the wet mixture onto the dry ingredients and mix until combined. -Fold the chocolate chips into the dough. -Take about 2 tablespoons of dough, roll it into a ball, and then press the dough between our fingers to flatten. Space cookies a couple inches apart. All done and ready to eat! 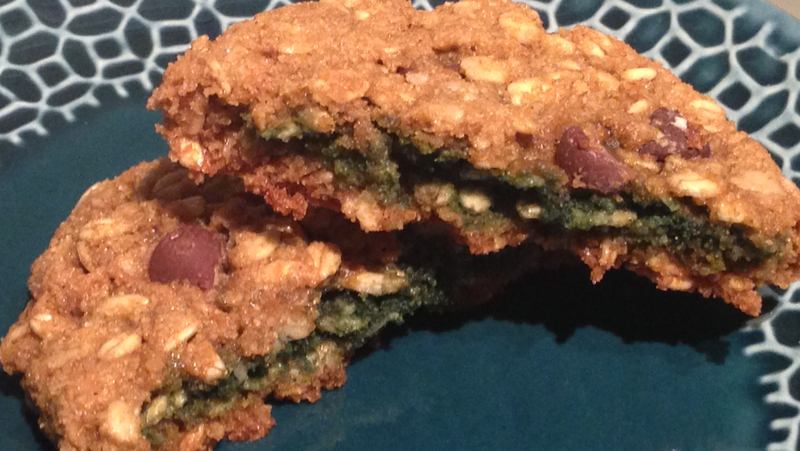 Chewy oatmeal cookies with a green centre. -Bake for 10 minutes at 350F until the cookies are golden brown on the bottom. Remove from oven and place onto a cooling rack for 15 minutes. -Enjoy and Happy St. Patrick’s Day!